How to build the best Fantasy Football Lineup ? Here you have some tips to help you picking 11 players to build the best Fantasy Football Lineup. These tips are good regardless of which league you play. No matter if you play Premier League, Champions League or others, with these tips you will always choose the best fantasy football lineup. 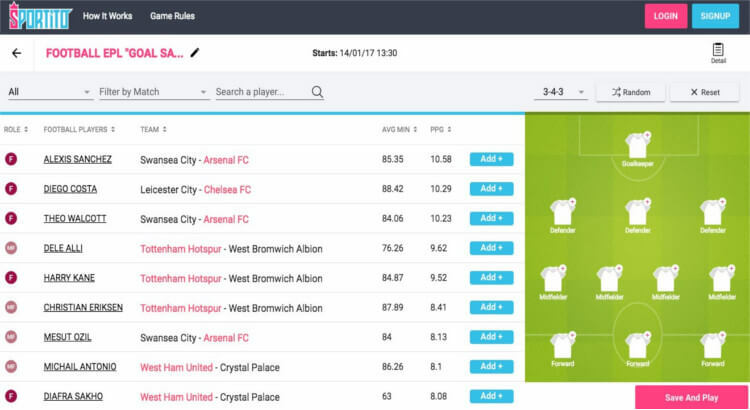 On Sportito every Fantasy Premier League manager is free from the salary cap restrictions so you don’t have to worry in acquiring productive players. However, you can’t choose more than 4 players for a single team, so you have to take care to signing strikers like Ibrahimovic, Aguero and Harry Kane from main teams like Manchester Utd, Manchester City and Tottenham, instead, you can get a couple of prolific mid-table strikers. That way, there’d still be ample space left to sign quality players to fill other areas of the squad. Another aspect you’ve got to take note of is the “equality among certain defenders”. A team’s clean sheet counts as a clean sheet for the defenders involved, thus, it’s best to opt for an hight average PPG defender in a club that doesn’t let it much goals rather than getting a more high-table defender from the same outfit. Instead of signing a team’s best centre-back, you can go for a much cheaper alternative who would still get points for not conceding a goal. Keeping track of upcoming fixtures is imperative to any fantasy football campaign so as to pick players who go up against relatively weaker teams. For example; Manchester City playing Sunderland should warrant a player of Aguero’s ilk to be included in your starting 11. He’s almost guaranteed to nick a goal against that type of opposition (this applies to other top teams taking on smaller sides. On the other hand, Aguero is less likely to score against teams like Tottenham and Arsenal). There’s no disputing the fact that your goalkeeper needs to play for a team in the top 6 of the Premier League, for the simple reason that he has to be able to keep clean sheets and concede very few goals in a bid to earn your Fantasy Premier League team some valuable points. The strength of a team’s back-four or back-three needs to be taken into consideration. Goalkeepers like Tom Heaton and Jordan Pickford get tested more than most goalies in the league due in large part to the defensive frailties of their respective sides. Any keeper outside of the top six would be more of a liability than an asset. Staying informed about injuries and suspensions is imperative to the success of any Fantasy Premier League campaign. Injuries or suspensions to the main players in your starting lineup should be handled with care. When a player is set to miss out on a game for one reason or another, it’s best to conduct an extensive search to find a like for like replacement capable of earning your fantasy team a load of points. Imagine a scenario where a player like Eden Hazard gets injured, who do you pick then? The more obvious replacements in midfield would be the likes of Sterling and Mahrez, but the best options actually play their trade in Liverpool; Philippe Coutinho and Mane. Always make sure to sign like for like players. Picking players that appear in most Fantasy Football Lineups will only leave you on par with a host of other FPL managers; instead, try to shake things up a bit by including players from relatively small sides in your lineup. To make this work, though, you’ve got to do it in a sensible manner, which more or less means selecting the most consistent players in a somewhat inconsistent group. Jermain Defoe is a brilliant example – he plays for one of the Premier League’s weakest sides, but he’s a consistent goalscorer nonetheless and an excellent addition to any team. Don’t go around picking mid-table players based on sheer hope; they’ve got to be proven performers not squad fillers.